Syrian President Blames 'Saboteurs' For Syria's Crisis : The Two-Way Analysts say the Syrian president offered vague promises for reform, while also making clear that his regime will continue to hold a hard line against dissent. Blaming "saboteurs" for the protests against his regime, Syrian President Bashar Assad today delivered an address to his nation that analysts are saying signals his government will continue to hold a hard line even as he also speaks about the legitimate demands for reform that protesters are making. "The Syrian president, facing three months of protests against his rule, has said a national dialogue will start soon but cautioned that no political solution was possible with people who were violent or carried arms. "In a speech at Damascus University on Monday, Bashar al-Assad said he would ask the justice ministry to study expanding a recent amnesty, but said it was important to differentiate between 'saboteurs' and people with legitimate demands." "[Assad] said Syria should deal with people's demands for reform but that a 'small faction' was exploiting popular grievances. 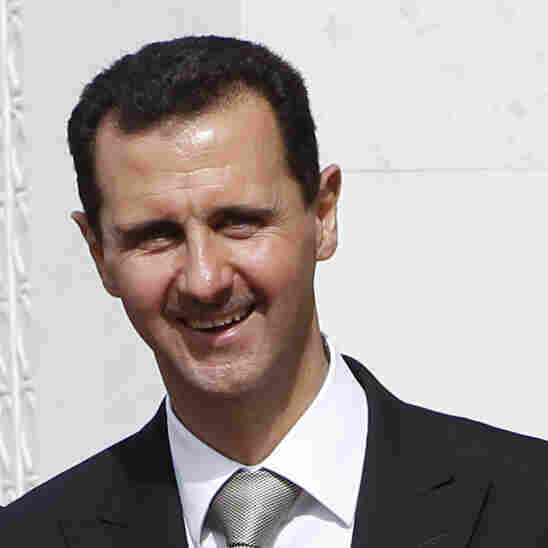 He said a national dialogue would shape Syria's future and urged people who had fled to Turkey to return. "Rights groups say at least 1,300 civilians died in protests since March. More than 300 soldiers and police have also been killed, they say." "I have not met a single person opposing reform. ... What we are doing now is to shape the future ... it will have consequences for the future generations for decades from now. ... We wish to ensure the most and the widest participation in the national dialogue." "Assad offered a bunch of technocratic reforms: a new electoral law, a commitment to root out corruption, media reform, reform of municipal government, and the launch of a national dialogue for reform that will include 100 personalities. ... Its contents were vague, and simply did not address the very serious crisis between the Syrian people and their state." Update at 8:40 a.m. ET. From Beirut, NPR's Deborah Amos reports for the Newscast desk that "Assad's speech lacked specifics" on reforms.